Volunteers from Mount Hood Community college portray Mary, Joseph and the three kings on a search for lodging. 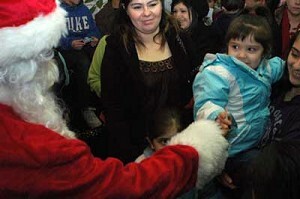 St. Nicholas greets families arriving to pick up gifts at El Programa Hispano. GRESHAM — Catholic faithful gathered here just before Christmas to commemorate Joseph and Mary's search for lodging in Bethlehem two millennia ago. It was also a chance to acquire a few gifts to put under the tree for children. 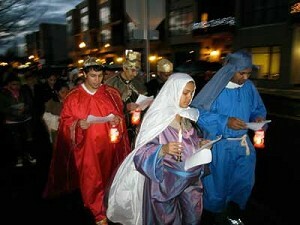 Las Posadas, Spanish for "the inns," is a Mexican tradition and part of nine days of prayer before Christmas. Catholic Charities of the Archdiocese of Portland has organized Las Posadas for nine years via its El Programa Hispano. Volunteers from Mount Hood Community College helped in the traditional drama Dec. 22. Daysis Guerrero took the part of Mary and Marvin Chevez was Joseph. About 75 El Programa Hispano clients followed the holy entourage, going to the Gresham library and nearby businesses, seeking shelter and singing Christmas songs. The outward rite mirrors an interior spiritual growth, in which the devotee seeks to make room for Jesus in his or her heart. The group returned to the Catholic Charities office, where they were finally granted a place to stay, and the Posadas party and gift distribution took place. Cultural traditions blended at the end of the night, as St. Nicholas was on hand to greet families with hearty belly laughs. Catholic Charities gave out more than 650 gifts: toys, clothing and food. The largest sources of the presents were the KGW Great Toy Drive and Monkey Business Sports, each of which supplied about 200 packages. One client said that the gifts she received from tonight's event will be the only gifts her children receive this Christmas. "This year's need is greater than ever, as many of our clients are feeling the effects of the economic downturn and are struggling to find work," says Roz Ramberg of Catholic Charities. Throughout the year, El Programa Hispano serves low-income Latinos in the Portland metro area. The program provides outreach to elderly Latinos, anti-poverty measures, a low-income taxpayer clinic, skill building, health and safety promoters, parent-child development and treatment for mental illness and addiction. El Programa Hispano also helps women and children suffering from domestic violence and sexual assault and works with students to help them succeed in school. Workers also provide rigorous case management for youths in gangs or at risk of being recruited. The program has offices in Gresham and Portland.